I am a very picky person when it comes to beauty products and once I find something I know and trust, I usually stick with it forever! 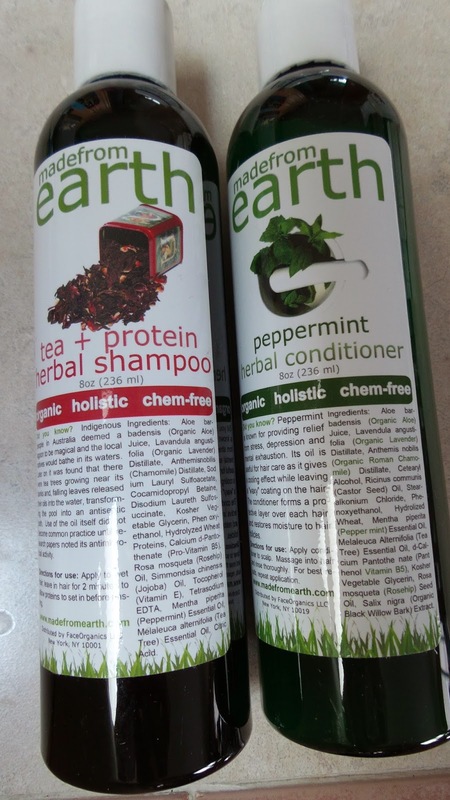 A while back I was given the opportunity to review a couple products from the brand Made from Earth which were quite unique from anything I had tried in the past. "Our line of organic skin care essentials contain the highest possible levels of organic ingredients and fruits. We have searched the entire USA for ingredients that meet our earth-friendly requirements and are hand-selected to provide you with exceptional skin care. Our ingredients / plants are from organic farms. There are no toxic ingredients in our products. There is no diluting or watering down of our potent organic plant ingredients. There is no synthetic coloring agents or fragrances, or paraffin and other petroleum products are permitted. Preservatives from synthetic sources are not permitted, such as Parabens (propyl, methyl and ethyl). We are 100% farmed and sourced in the USA." 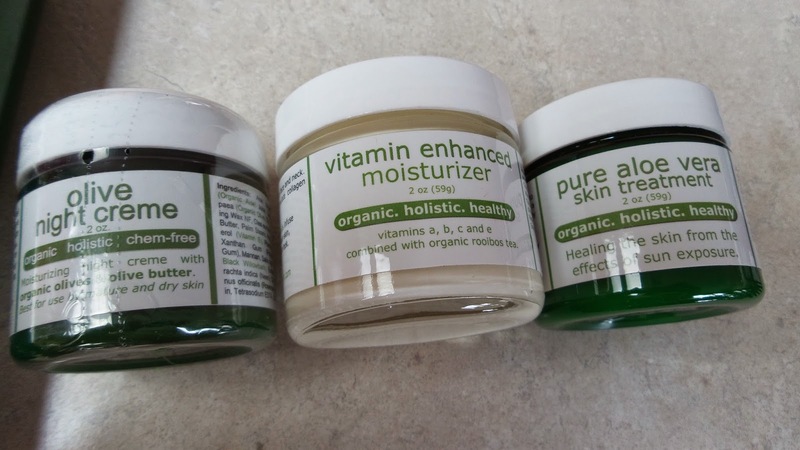 Made from Earth sent me over their Peppermint Conditioner, Tea Tree + Protein Herbal Shampoo, Pure Aloe Vera Skin Treatment, Olive Night Creme, Vitamin C Moisturizer and Three Berry Serum products to review this time around. I was pretty pumped about the hair products especially since I am especially picky about the products I use on my hair because of all the dying I do to it! I will say this is, the Three Berry Serum felt very refreshing and clean smelling when rubbed all over my face. I didn't feel like I needed to add any additional moisturizer like was recommended to go along with the serum. I really think it helped with my puffy eyes after several days use too. The Vitamin C Moisturizer felt a bit heavy for me for normal daily use but is supposed to be "excellent in boosting collagen production and creating healthy new skin cells." The smell was a soft, subtle one too! I loved the Pure Aloe Vera Skin Treatment as it felt as if I was taking it straight from my plant. The smell was completely refreshing and it wasn't as gooey as it normally is when it comes from the plant. It was especially nice using after it's been kept in the fridge and I plan on using it after a long day outside gardening this summer! Because I don't usually use night cream, the Olive Night Creme, again was a bit heavy for me for normal daily use. The Tea Protein Shampoo had a pretty subtle effect however it felt great using especially since I have been experiencing a dry scalp lately due to this weather. And finally giving the conditioner a try I had no idea what I was in for. I love anything mint flavored, the smell of mint and even the feel of using something infused with it. This has to be the best and most ultimate product ever using mint. Upon opening and literally just squirting a bit into my hands, my entire shower and bathroom was filled with an overpowering mint scent. I have to warn you though if you are not a fan normally, this might not be for you. It was so powerful it initially made my eyes water quite a bit. The cooling and tingling feel it had on my scalp was beyond exhilarating. This not only lasted through the entire shower and but after but even throughout the day as I would redo my ponytail or play with my hair. Although it didn't have that silky, conditioned feel (which I actually prefer since my hair is normally curly and dry), it was still super soft and untangled easily when brushing. 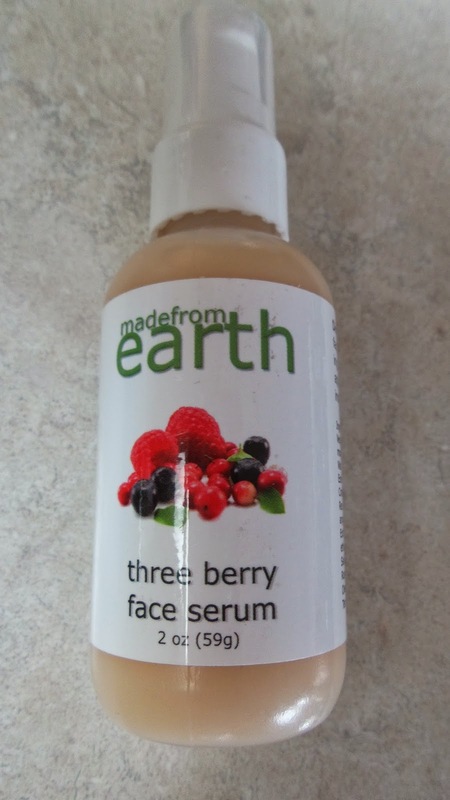 Giveaway: Made from Earth is going to give one of A Lucky Ladybug's lucky readers a a bottle of the Three Berry Face Serum to have of their own! My knees need a lot of improving. They are always dry and red and I hate wearing shorts. My hands and wrists are really dry from winter and washing my hands. My moisturizers need some improving! I'm constantly looking for something good; the search continues, lol. I love this type of giveaway: skin care products. Would love to see more of them--I also like the food-oriented ones: candy, etc., not picky, lol. I really need improving for my hands. They are always dry and cracked and are starting to look old. An area of my body that needs the most attention is my face. In particular, I need a cleanser that will not make my skin feel tight. To be honest, I am not familiar with your blog. However, I think it is very attractive. I love the realistic shamrocks shining with dew drops. I like the header picture of the ladybug. The font you use is attractive. I like the layout of your blog. All in all, it is very nicely done. Definately my hands. They are always cracked & dry even though I do moisturize. My poor, abused, and very dry feet need the most help. My face products could use some updating. Guess I would say my feet need the most work because I do a lot of backpacking. My elbows and knees could use some loving .... they are always so cracked and dry no matter what I do with them !! I would say my hands are really dry and also my face I need a cleanser that will not dry my skin but will help with my problem areas. My tummy always needs some help. My elbows can use some serious moisture. They are so dry that they start cracking. My elbows need improving. They are always sovery dry. My feet need some TLC to get ready for sandal season. Definitely my face, especially after the long winter we just had! My arms they have small scars from when I had chicken pocks as an adult and my skin is ashy. My legs could use it. I have always liked this blog just the way it is! My legs, I really want them to be softer! My wife's hair is dry and has some damage. Her skin is dry. I like growing into green.